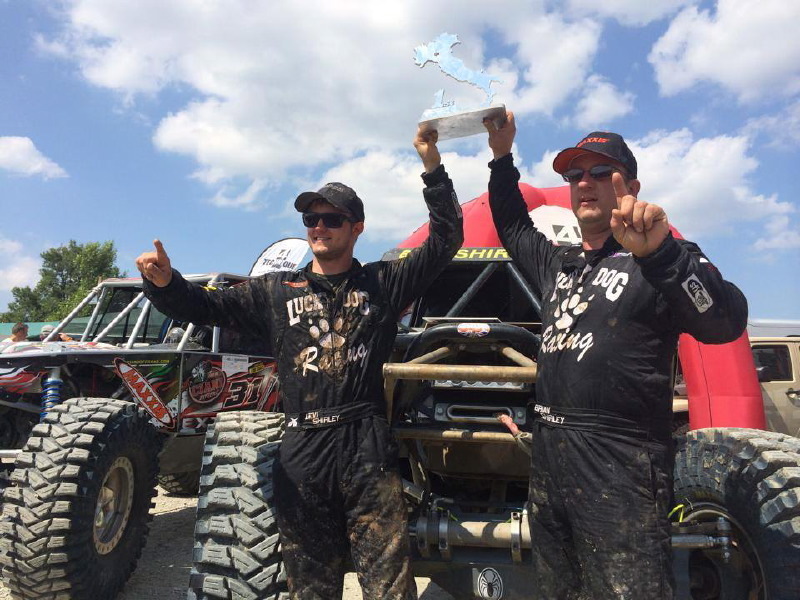 April 4th, a short 6 weeks after the King of the Hammers, the Eastern Ultra4s series kicked off in Hot Springs, Arkansas where Levi Shirley drove his ‘old straight axle car’ to 5th place with co-driver Aaron Dupree. With the finish, Levi Shirley successfully qualified for the 2015 King of the Hammers, a huge relief after missing the 20 spot cut off at KOH by one spot. 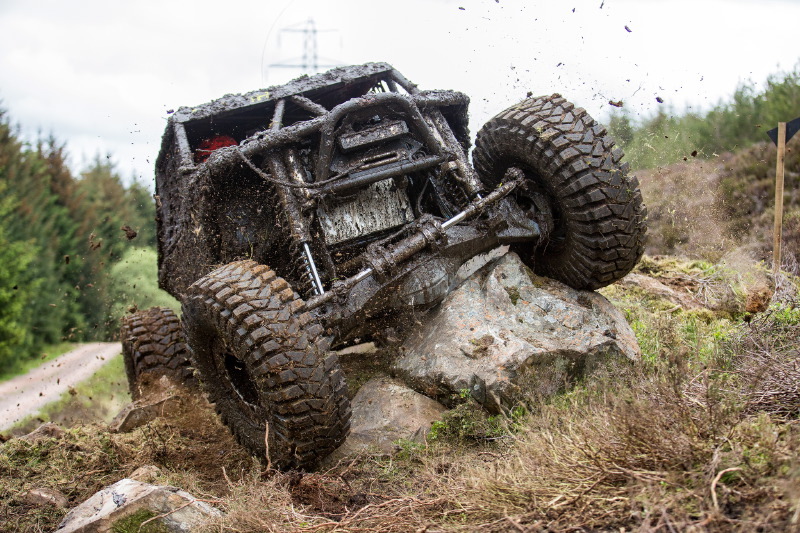 “The terrain in Arkansas was perfect for our Maxxis tires. The moisture in the ground was not muddy, and it was perfectly tacky in the trees,” recalls Levi. “Our goal is to finish and stay consistent which will hopefully put us at the top of the season points by the end of the year.” Brian Shirley also raced finishing 14th. With a short break between races, Levi and the entire Lucky Dog Racing team in Dodge City, Kansas worked diligently on finishing the Campbell single seat IFS chassis that would soon debut as Levi Shirley’s new car at the Ultra4 Stampede. At the same time, on the other side of the pond in England, Levi was guiding the build of a 2-seat car: Off Road Armoury Euro-Fighter. “It is a little crazy to be building two cars in two different countries right now. But, I guess I can’t complain about that problem,” said Levi. Two weeks later, Levi was debuting his new Single Seat IFS car at the Ultra4s Western MetalCloak NorCal Stampede. “Again, we literally drove the car around the parking lot, rolled it on the trailer to drive 27 hours to test…at a race. There weren’t any significant bugs, just a lot of little ones. I think the biggest bug was me trying to learn how to drive it,” laughed Levi. Levi ran some fast lap times and placed third in his heat auto advancing to the main event. In the main, the suspension bolt would break taking him out of the race, leaving him to finish 23rd. Exactly one week later on June 27th the Lucky Dog Racing team was at the Badlands in Indiana for the second Ultra4s Eastern Series race. Sitting back in the Single Seat IFS car, Levi qualified 4th. “I knew it was going to be a wet race, but I didn’t know how wet. It poured a ½ inch of rain a couple hours before the race,” remembers Levi. “My race started by belly hanging myself on a log and having to get out and winch myself off it. Then I threw a belt but didn’t have an extra, so I ran backwards on the racecourse about a ½ mile before I found it, ran back to the car and put it on. But the final straw that ended my day was on lap 5 when my throttle stuck and I hit a tree that rolled me into another group of trees…there was no winching me out of that situation.” Brian Shirley was running a fast race, in the top 3 when the water took out the alternator; his #18 car finished 18th. A week and a half later, the team is currently on the road to Glen Helen for the second Ultra4s Western Series race. There are still two Ultra4 Europe races to attend – King of the Valleys and King of Portugal; there are two Ultra4s Western Series races to attend – Glen Helen and Miller Motorsports Park; there is one more Ultra4s Eastern Series race to attend – Sturgis Blowout; and the Ultra4 National Finals. About Levi Shirley: At only 21 years old, Levi already has a 2012 Dirt Riot National Championship, 2012 & 2013 Dirt Riot Central Championship, 2013 Ultra4 European Championship, 2011 & 2012 Ultra4 Top 10 Series Points finishes and in 2011 was voted “Sportsman of the Year” unanimously by all competing drivers. Levi grew up in the small town of Dodge City watching his dad, Brian raced stock cars. Levi watched and learned as his father’s number one fan. At nine, his turn arrived to get behind the wheel of a go-kart. At thirteen, Levi moved up to miniature stock cars where he won multiple races and capped the season off by winning the overall points in 2005. In 2008, at fifteen, he proved he had what it took to compete and finished his first season racing in the XORRA where he consistently placed in the top ten. The following year, proving his accomplishments were no fluke, Levi became the youngest driver to ever win an XORRA event. Returning to the podium multiple times in 2009 placing 3rd in the XORRA points in both the East and West Coast Series. In 2010, Levi not only graduated from high school but also became the Colorado Hill Climb Associations’ Rookie of the Year. In 2011 Levi finished 7th in the overall points for the Ultra 4 Series and was voted “Sportsman of the Year” unanimously by all competing drivers. In 2012, Levi raced the full season of Dirt Riot earning the Dirt Riot National Championship and the Central Series Championship while also placing in the top 10 in overall Ultra4 Series Points. In 2013, Levi was the Dirt Riot Nation Champion runner up to his Dad Brian, Central Series Champion, the Dirt Riot UTV National Champion, while also racing Ultra4 and capturing the Ultra4 European Championship. 2014 has already started on a good note with a 21st finish at the King of the Hammers, two new cars being built and a race schedule that includes both the Western, Eastern and European Ultra4 races. About Brian Shirley: Brian Shirley has never missed an East or West Coast Series event. His consistency has earned him several wins and many podium finishes in XORRA Series from 2007-20XX and the 2008 MOROC Unlimited Series Champion. In 2011 he was the Dirt Riot National Points Runner up (to Levi) and was 10th in the Ultra4 Series. In 2012, Brian finished in the Top 10 Series points of Ultra4 Racing and was the runner up in the Dirt Riot National points (to Levi), Dirt Riot Central Series (to Levi), and in the Dirt Riot Mountain Series. In 2013 Brian earned the Dirt Riot National Championship Points title and was the runner up in the Dirt Riot Central Series (to Levi). 2014 has started on a high note with a 20th place finish at the Griffin King of the Hammers. Born in 1963, Brian still lives in the small town of Dodge City, Kansas where he was born. He started his winnings at 14 as a Team Roping Champion. At one point Brian was a jockey riding racehorses across the US then attended college on rodeo scholarships and graduated from Northwestern Oklahoma State University. In the early 1990’s, motorsports took over his need for speed and competition becoming involved in recreational 4-wheeling and stock car racing at the local 3/8 dirt and asphalt tracks. Lucky Dog Racing has a reputation for always being at the races and giving 100%.